Of money. You might be thinking otherwise. We doubt exchanging a pile of wolf pelts would convince the maker of this wonderful model that a transaction if forthcoming. 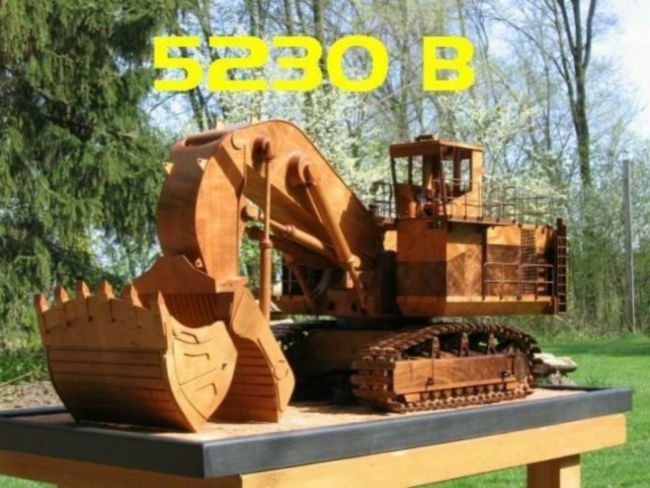 Seen below is an incredible 1/16th scale model of a Caterpillar excavator made of cherry and walnut wood. The painstaking part comes to the fore when you realize this wasn’t carved out of a few logs; Rob Fisher whittled down each part and assembled them. It took Rob 3,000 hours of labor to finally realize his vision for the excavator. That’s a lot of time and concentration—not to mention painstaking work—put to good use. The most incredible feature of his creation is every part moves, even the treads, which were made one at a time before they were linked. Ditto the jaws. Just don’t try to play with this (if it’s ever in your possession) because some of the exquisitely hand crafted parts might get damaged. What would really be cool if Rob could set his sites on another mega machine, but that would be wishful thinking. Let the artist chart his own course. The Caterpillar excavator is currently selling for a generous $39,500 on—where else—Etsy.